Yes, this is really a good recipe to wear a printed dress when feeling uninspired! Both of the looks are very creative and I think how good that you wore insted the planned purple scarf the blue one as I love these colour match with the purple dress and bag! And I'm very surprised you wore both times the same blazer as both outfits are totally different! I really like your makeup in the second photo, Mica! Very pretty and complements your dress perfectly. And the fern print of your first dress is gorgeous too! Very subtle and unique! Thanks Gina! I try wear makeup to work to look a little more presentable in the office! I am obsessed with that first dress and it's print! I adore the layering with both looks! Dresses really are the best when you don't know or want to think about what to wear! Both of these are lovely! They really are great outfit options like that! Love this looks, Great post! x. 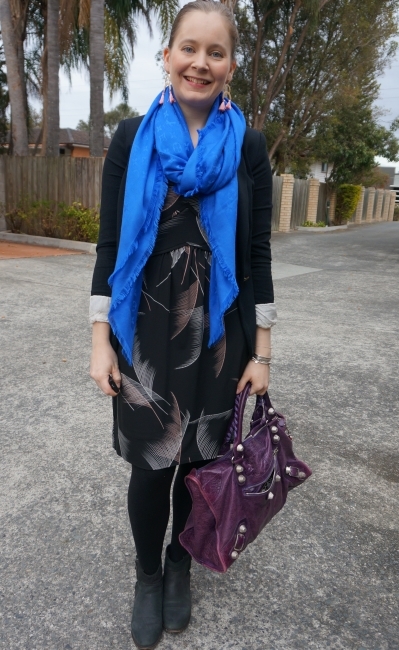 A pretty dress and a bold colored scarf is a great outfit choice! I love the pop of color. Looking gorgeous in both girl! my personal favourite is the oranges because I love warm tones for the fall but you look greta in both! 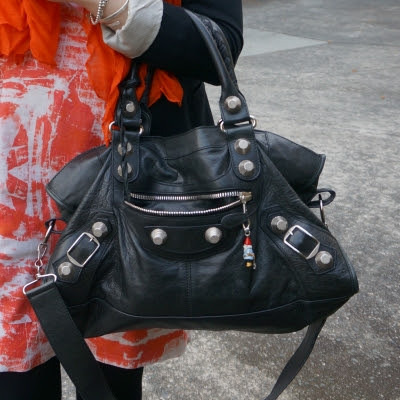 You are so stylish and I LOVE LOVE your handbag, babe! I'm here for all the bright scarf. Don't know why you wear a dress when your not inspired. Dresses are fabulous. I think the first one is very beautiful! They are such an easy, instant outfit when I'm not inspired or motivated enough to plan an outfit with separates, haha! Dresses are the easiest go-to ever! Both of these fall into my "jammy dress" category. You just put 'em on and bam! You're dressed! 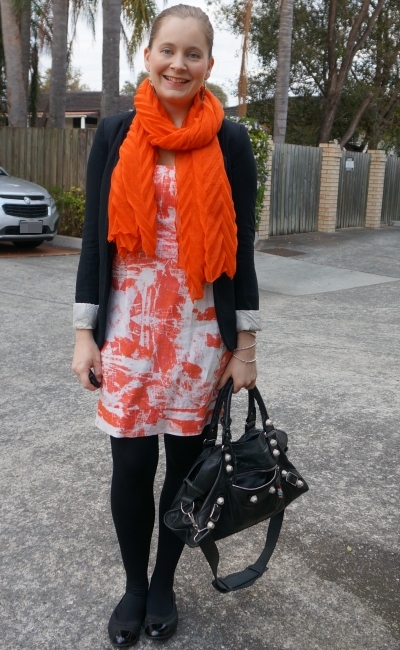 I love the bright pops of blue and orange that your scarves give the outfits - nicely done. I no longer worry about mis-matched jewelry - whatever! Like anyone would even notice that. I like compliments from people on the street, especially people who stand out there all day - I figure they see the masses of humanity going by, all dressed in black and beige - anyone they call out to has got to be a pretty special-looking person. Print dresses are really one of my faves.....you can even get away with hardly any accessories that way!! The orange is such a great, bright color----I love it!! Thanks Deb, I've been relying on that hairstyle a lot recently! I love that blue scarf! I think it actually looks amazing with the purple bag! These are both such beautiful outfits. I love the prints of both dresses and the more contrasting colors of the first look and the matching colors in the second. Yes to the printed dress! I really like that Leona Edmiston dress in the first outfit - it goes so well with all the accessories. 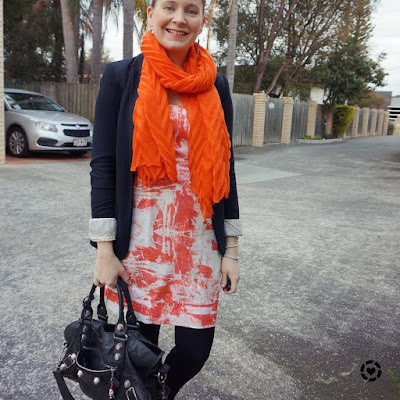 The orange scarf in the second outfit is just gorgeous - you look great! Loving the bright vibrant colours Mica. Hey thanks for helping me with my office look! I love both these printed dresses:) And love how you balanced the whole look with the scarves and shoes. That LV scarf is such a great purchase for sure, Mica! The cutest bags! If you wore the purple and orange together, you'd be dressed like our alma mater, Clemson University! I have never tried orange and purple together, maybe I should! I love the way a colorful scarf adds a fun pop to a look! Happy Tuesday, girlfriend! Yes, scarves are great for that. Oh that second outfit is amazing. I think its the colour orange. So vibrant and wonderful. I love the idea of adding bright scarves and the second outfit is my faovurite. 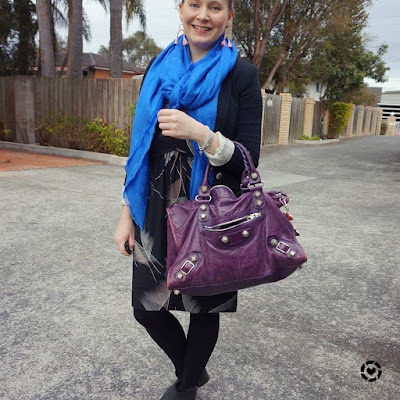 I usually like to wear colourful scarves during the dark and colder months. Great video as well. You're looking very professional and stylish in these outfits babe! 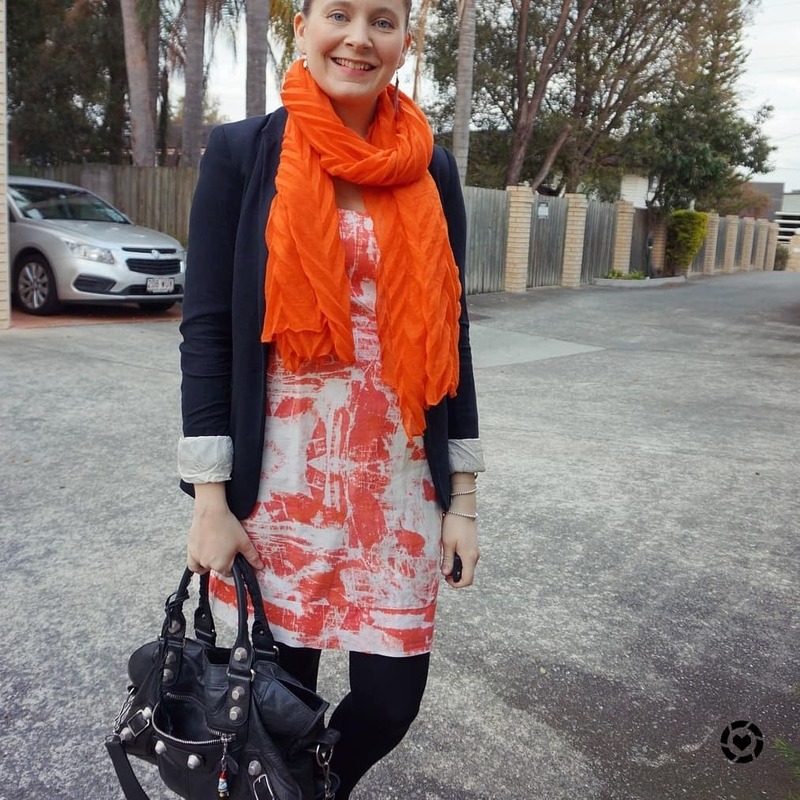 I love your collection of scarves; the orange one is particularly striking :) Hope you're having a lovely week so far! A colorful scarf really makes such a difference--they really pop in both of these looks. I especially love the colors together in that first look--the dark purple and bold blue, together with the black and gray... gorgeous!! Love that look. You can never go wrong with a printed dress. Orange is totally you color. Hope you are having a great week so far. I need more dresses in my life. I don't have a lot. And yes printed frocks are so much fun. I am loving the leaf print on the first dress or I think it is a leaves. But either way it is so pretty. And like it with the jacket too. And of course have to have that pop of color. Thanks Allie. I think it's meant to be ferns? It's a lovely print either way! Wow! That scarf and dress in your second outfit are spot on together! What a great color match! I love how the darker blazer helps to ground the outfit too! These are fabulous work outfits! Some great looks for the office! I love throwing a scarf on! I love using bold colored accessories to brighten up otherwise dark and plain work outfits, but I admit I love the second outfit more. It looks so fun and energetic! Love how you style your scarves dear. Such a pretty pop of color on both looks. I really adore printed dresses as well, the red and white is so beautiful! That blue scarf is so pretty! 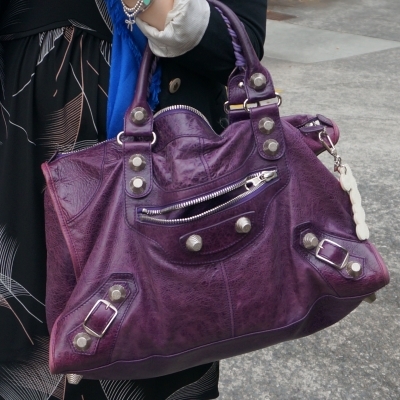 Love the purple Balenciaga too! Love those dresses and the pop of colour!